Ships from Canada. Most customers receive within 3-18 days. Get the 1TB Tom Clancy's The Division Bundle, featuring a 1TB hard drive and a full-game download of Tom Clancy's The Division. Create your own powerful agent to take back New York City from dangerous factions during a deadly pandemic in Tom Clancy's The Division, an online, open world RPG experience like no other. Team up with friends in co-op on Xbox Live, acquiring new skills and weapons as you investigate the source of the virus and engage in fierce battles together. Play and store more games than ever, including your digital and disc-based Xbox 360 games, with a 1TB hard drive. •	This product includes: 1TB hard drive Xbox One, Tom Clancy's The Division, newly updated Xbox One black wireless controller with a 3.5mm headset jack so you can plug in any compatible headset, 14-day trial of Xbox Live Gold, AC Power Cable, and an HDMI Cable. •	Take back New York City from a deadly pandemic in The Division, an online, open-world, RPG experience like no other. •	Get new game content first on Xbox. •	Quickly switch between your games, live TV, and apps like Amazon Video, Netflix, YouTube, and HBO GO. •	Play select Xbox 360 games on your Xbox One with backwards compatibility. Cons: Didn't receive the 1T or game originally but they fixed the situation for me. Pros: I ordered two and luckily they came with everything stated. I was happy they included the original box for one unit. The Division vouchers are brand new which is a plus so I know the codes are good. Each unit looks good. You could give the console and A+ cosmetic grade. 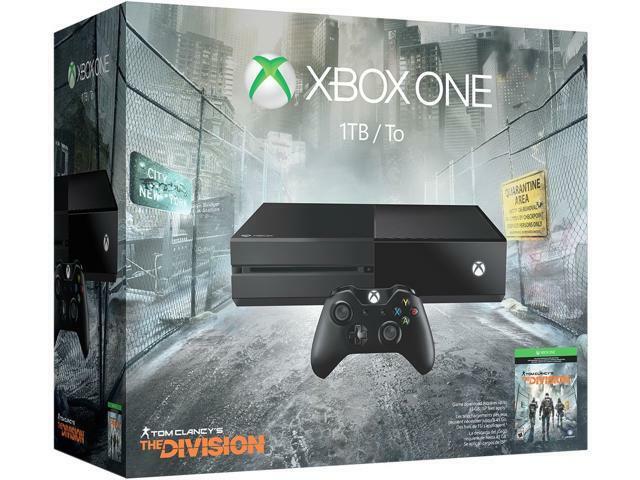 Cons: it would be nice if they did include the original Division bundle box. I like to keep console boxes especially with the graphics on it. These really aren't the original Division bundle boxes. They are just 1TB consoles with the voucher inside. One of the consoles 14 day xbox live membership voucher was also already used and worthless but that is minor. Other Thoughts: I had an issue with an order similar to these bundles from this seller. So far they are slowly trying to correct the issue. I was lucky with this deal at least and got exactly what was stated. Don't know if everyone else made out well either. I didn't check the consoles yet either to see if they are 1TB but hopefully they are. Great deal for $150 on this purchase!